Chef Stephanie Izard of Chicago’s Girl & the Goat is a grilling genius. Here, she gives a tutorial to her husband, a craft-beer expert—and he returns the favor with a pairing lesson. 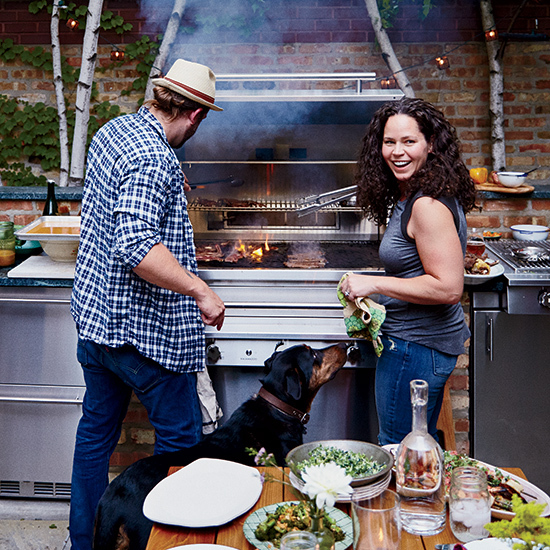 Chef Stephanie Izard of Chicago’s Girl & the Goat is a grilling genius. Here, she gives a tutorial to her husband, Gary Valentine, a craft-beer expert—and he returns the favor with a pairing lesson. Thin cuts of meat, like short ribs, are easier to cook than thick ones. To gauge doneness, “I use the smell test, like, ‘Smells done to me!’ ” Gary says. “Getting Gary to eat vegetables was a big part of our marriage,” says Stephanie, who made him a convert by marinating broccoli before grilling. “Sours are crazy when you first try them,” says Stephanie, “but they pair really well with food”—even the Skillet Graham Cake with Peaches and Blueberries. “Some beers are good for sipping on their own, like an IPA, while bigger beers [like Founders Black Rye ale] need to be tasted with food to be appreciated,” Stephanie says. “There are so many new breweries in Chicago—the city is almost at pre-Prohibition levels,” Stephanie says.